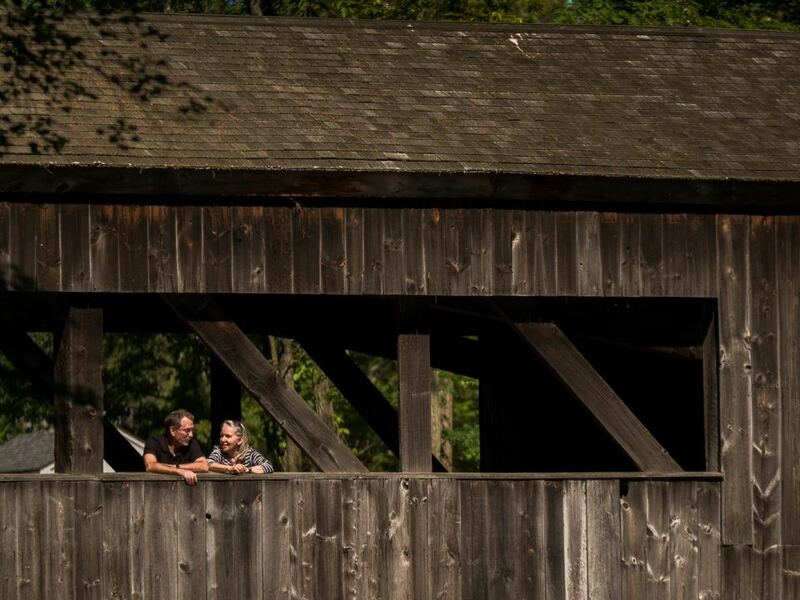 Visitors can walk inside a covered bridge spanning the Quinebaug River, which runs through the Village, and learn about the importance of this river to the region. Quinebaug is a Native American word meaning “long, slow-moving river.” The bridge itself was built in the 1930s and the wooden covering added in 1953. Until a flood in 1955 it served as the main entrance to Old Sturbridge Village. The exact origin of the Quinebaug River is difficult to pinpoint, but it appears to start at Mashapaug Pond in Connecticut. From there it flows northward into Massachusetts, through Sturbridge and other towns, and then turns southward to Connecticut again. Near Norwich, Connecticut, it joins with the Shetucket River to become the Thames River. The water eventually reaches the seacoast town of New London, where it flows into Long Island Sound and then the Atlantic Ocean. Scenic river landscapes became bustling manufacturing centers in the 1800s, and during the Industrial Revolution, this gently flowing stream powered thousands of machines in scores of factories in Massachusetts and Connecticut. Early New Englanders dammed and channeled their river resources to harness power for mills and factories.